While at the thrift store with a friend, I found a coffee table that had a space for two panes of glass on top. Of course the glass was missing and it was only five bucks so I brought it home. The finish was a horrible peachy antiqued color and hard to remove. I had read about a gel stain to go over this type of problem finish called General’s Gel Stain. I ordered the walnut color gel stain and it went on beautifully. A clear coat from the General product line was used as a topcoat. To make the upholstered bench top I measured the top and cut plywood to that measurement. I drilled holes in the plywood in the pattern I chose for the buttons. 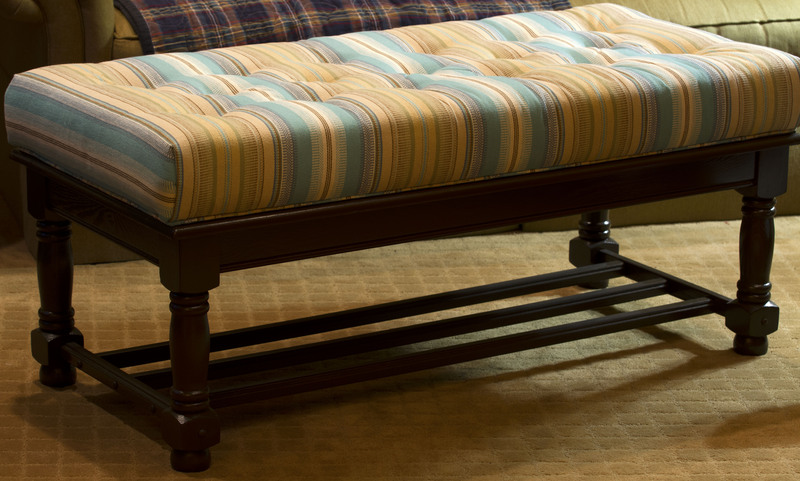 (Even if you are not tufting your bench, drill a few holes for the air to escape when the foam is compressed when sat upon.) I used a 4 inch piece of foam and wrapped it in batting to soften the edges. Using a remnant found at our local fabric store, I covered the foam. I didn’t have a button press to make the covered buttons and the fabric was thick so I went to an upholstery shop and had the buttons made. 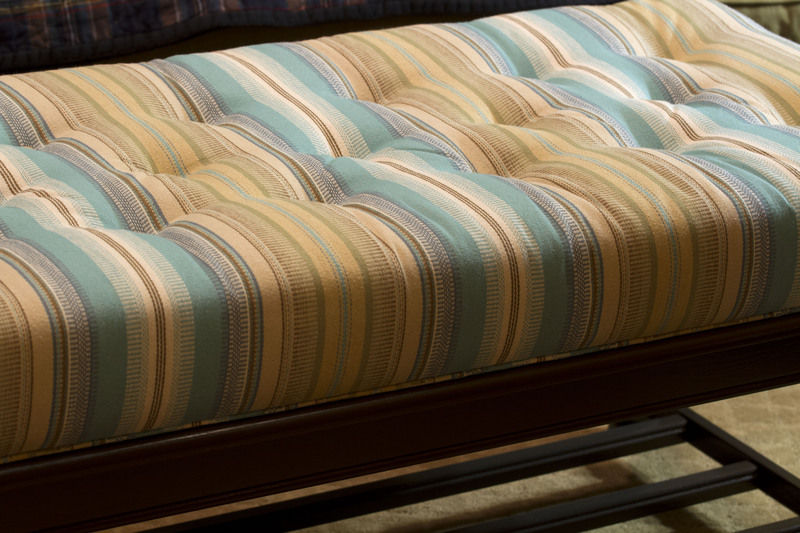 After aligning the stripes up and attaching the fabric under the edge of the plywood with staples, I used a long needle to go through the holes I drilled to make tufting in the bench. (There are several products to use for the tufting such as a strong upholstery thread or wire.) I then sewed piping and stapled the piping around the bottom edge of the plywood. Next I positioned the upholstered plywood on top of the coffee table and screwed it on from underneath the top framework. Now we have a beautiful bench inexpensively and most important a fun DIY. 18 Feb	This entry was published on February 18, 2014 at 2:50 am. It’s filed under DIY, Re-purpose, Re-purpose Gallery and tagged bench, coffee table, DIY, furniture make-over, make-over, re-purpose, re-upholstery, up-cycle, upholstered bench. Bookmark the permalink. Follow any comments here with the RSS feed for this post. Love this! I’ve been looking for a cheap coffee table to make a bed bench but haven’t found “the one” yet. Yours looks fantastic!